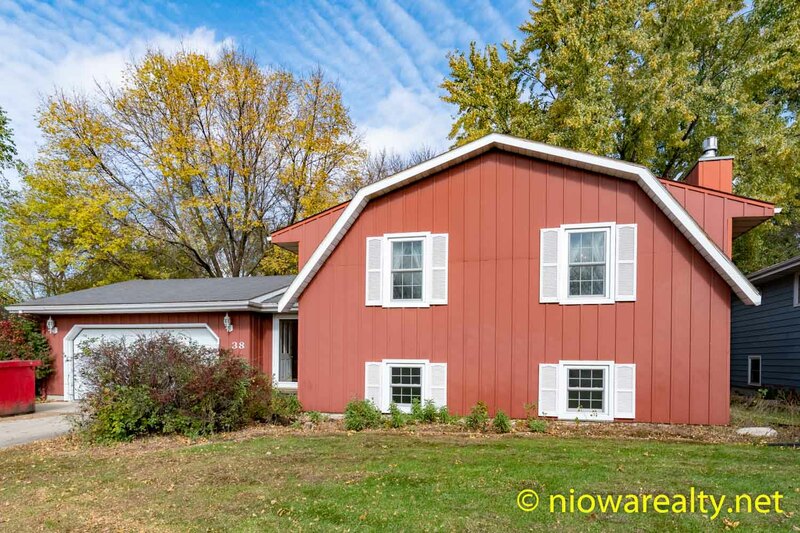 Share the post "38 N. Willowgreen Court"
Alas the sun was shining for about four hours today which was better than nothing considering our many days without. The leaves have certainly been falling all the more since yesterday morning’s frost which means we’ve got some raking to do. Having seen at least ten deer within our city limits today, I’m staying exceptionally hopeful there’ll be many bow hunters getting permits to get rid of those bloated herds. Their devastations just this year alone, is enough to make anyone want to have a permanent open season on them until their populations have been reduced by 90 percent. As far as I’m concerned, they should now be considered an invasive species in North Iowa. I’ll not be surprised if I once again see another buck running around in our Historic Downtown before winter arrives. The bulk of my morning was spent listing a home here in Mason City that’s located at 38 N. Willowgreen Court, which is in a popular subdivision on the southwest side of our City. I’m pretty sure it’ll get sold more sooner than later because it offers 4 bedrooms, 1 3/4 baths, along with having some pretty big ticket updates recently made which include new floor coverings, and the recent installation of thermal windows in the entire house which totaled over $15K and have a transferrable warranty on them. Now that’s some pretty big bucks that were recently spent. Other features of the home which will make it all the more popular with buyers, is the lighter oak woodwork, the gas log fireplace in its lower level rec room, a double attached garage, and enduring metal siding. The big draw I noticed, is the fabulous view of Sunset Lake from its rear windows and back deck. I’m of the belief it’ll sell quickly as long as we still have buyers out there. We priced it at $165,500 just so it’ll get sold quickly, and if you know of anyone looking for an extra roomy home for their growing family, you can bet it’ll fill their needs. The above photo is the exterior shot I took this morning, but be sure to take a look at the rest I’ve posted. Much to my delight, I had far more people attending my public open house at the condo located at 361 S. Pennsylvania, Unit 2-C. Believe it or not, I had 12 fliers printed out and every one of them were gone by the time 3:00 pm rolled around. I was very happy to hear many good comments as well as some serious interest. There’s one particular person who’ll be calling me on Monday for some additional information I didn’t have available. Even though I’m not personally acquainted with that person, just the short time we conversed, I’d say the existing condo owners will be tickled to have such a fine mind as their new neighbor. While there, I was falling in love all over again with its huge covered patio that faces Willow Creek. Now that all the furniture is out, I’m going to take new photos of the unit and place them online. If I were living there, I’d be out on that patio whenever possible. You can be assured that with it being so high above the ground, you’ll definitely be higher than that nasty mosquito zone. I wanted to mention a few things about a conversation I had yesterday with a well known on a subject of which I’m becoming all the more sensitive. We somehow ended up talking about a few people who wish bad things on others and then gloating over them whenever they come to pass. Because I’ve grown too familiar with such wishings of ill on others over these long years in real estate sales, I couldn’t help but climb upon my soapbox regarding such craziness. As far as I’m concerned, people who gloat over the pains of others and continue to wish all the more ill on them, are truly sick, but what’s unfortunate about such characters, is that they haven’t a clue they’re also being kicked back upon in others areas of their lives. They’re always the first to squeal like piggies whenever they develop serious health problems, tragedies, divorce, death, unemployment, or financial losses. Do you ever wonder why some families seem to have near perfect lives? Well, I can tell you, I’ve been around a number of them, and I’ve come to believe the key ingredient contained within their circles, are the self-less intentions they make towards each other, their friends and neighbors, their communities, and sometimes even to the point of wanting the best for those belonging to those very same ill-wishing groups. With that said, don’t you think it would be in the best interest of the entire human race to start living their lives with the best of intentions for others? Can you imagine what a wonderful world we’d be living in? I’d almost bet we’d be entering the realm of the peaceable kingdom, and once there, I’m convinced there’d be no one wanting to go back. Now as a flip-side footnote, please don’t think me to be a clever naughty monkey when reading the following one-liner. Tonight’s one-liner is: Nevertheless, it’s even harder for the average ape to believe he’s descended from man.